Travel in the style of the ancient pharaohs along the storied Nile River—the lifeblood of Egypt. Gaze up at the Pyramids at Giza, and discover the world’s largest collection of Egyptian artifacts at Cairo’s Egyptian Museum. Explore the spectacular Valley of the Kings and Valley of the Queens, where Egypt’s great pharaohs constructed elaborate tombs and monuments among the desolate desert cliffs; and puzzle over the colorful hieroglyphs on the Temple of Hathor at Dendera and the remarkable royal imagery in the mortuary Temple of Hatshepsut. Enjoy traditional dance and music performances aboard our luxurious ship as we glide past bustling villages, lush palm forests, and striking remnants of Egypt’s multilayered history. As we sail this storied waterway, enjoy the freedom and flexibility to tailor the itinerary to your interests, choosing from a variety of available excursions at each port of call—from guided tours of iconic sites to culinary experiences and active adventures. National Geographic photographer Ken Garrett specializes in documenting ancient civilizations, archaeology, and human evolution. With an academic background in anthropology and investigative inquiry, Ken’s work gradually focused on his passion for the Origin of Civilization. In a career spanning over 40 years, Ken Garrett has photographed more than 60 feature stories for National Geographic and National Geographic Traveler magazines, and has been involved with multiple National Geographic books and museum exhibits. Ken’s work in Egypt started in 1994 with a National Geographic magazine feature story on Egypt’s Old Kingdom, followed by a major piece on the Valley of the Kings. Once established in Egypt, Ken went on to photograph 14 stories on new discoveries related to ancient Egypt, from predynastic to the times of Cleopatra. Some six book projects in Egypt were highlighted by “Egypt of the Pharaohs” and "The King Tut Exhibit Catalog," which was a huge success worldwide. Garrett’s work with Tutankhamun continued with the CT Scan of Tut and the DNA of the Tutankhamun Family, and more recently, the ongoing search for Queen Nefertiti has kept Ken busy until the present. Beyond Egyptian history, the subject of his work has ranged from Meso American civilizations to human evolution stories and more, and he has photographed on all seven continents. During his career in magazine journalism, Ken has also worked for a variety of publications, including Time, Fortune, Forbes, Smithsonian, Audubon, Natural History, Science 80, German GEO, Air and Space, as well as clients such as Marriott, IBM, Starbucks, UNC Aviation, and The Aluminum Association. Fly from London Heathrow. Regional airports available on request. Your journey into wonder begins in Giza with a three-night Special Stay. Soak up the magnificent views of the Great Pyramids from the balcony of your contemporary suite in this palatial 5-star setting. Set amongst 16 hectares of gardens, it boasts the perfect mix of ancient heritage and 21st century comfort and style. Enjoy welcome drinks and dinner as the sun sets over the oldest of the Seven Wonders of the World. Set out this morning to explore the Pyramids at Giza, elaborate burial complexes built some 4,500 years ago for Egyptian pharaohs. Our hotel is situated at the foot of the pyramids, ensuring that we arrive before the crowds for a peaceful view of the sun rising over the limestone peaks. Next, visit the Solar Boat Museum, home to a restored cedarwood barge built to transport Pharaoh Khufu to the afterlife and sealed in the Great Pyramid around 2500 B.C. Ponder the riddle of the Great Sphinx, the 240-foot-long monolith carved out of the limestone bedrock of the Giza plateau during the reign of Pharaoh Khafre. Then learn about the rich history of the Nile region during a talk given by our National Geographic expert. After the sun goes down, see the pyramids illuminated by Giza’s spectacular multicolored light show. 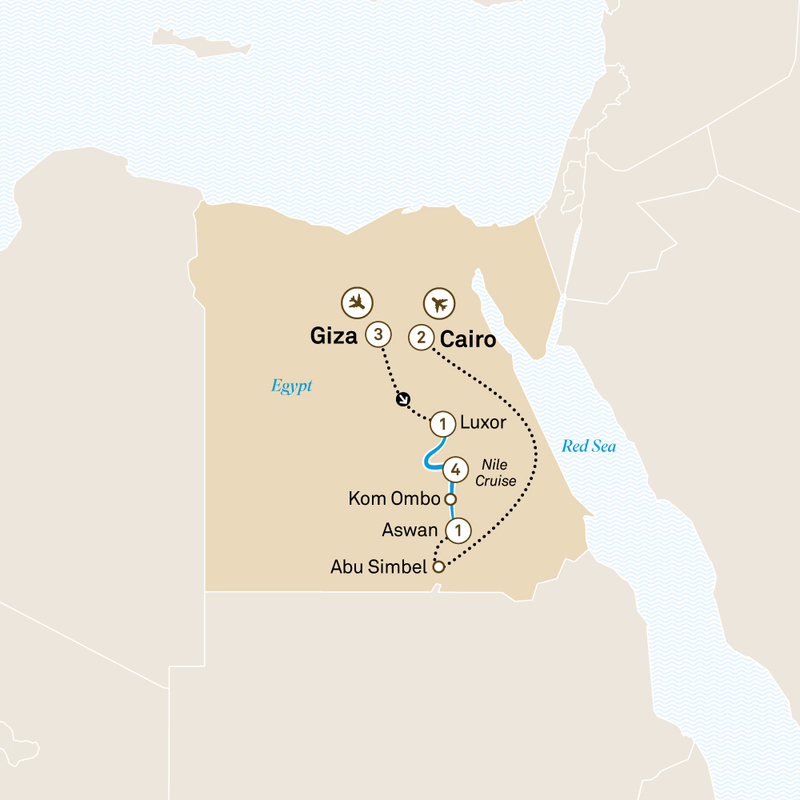 Today we make our way to Dendera, one of the best-preserved temple complexes in Egypt. Enormous mud brick ramparts enclose more than 130,000 square feet of desert studded with remnants of shrines and towering colonnades. Marvel at the vibrantly painted hieroglyphs adorning the roof of the Temple of Hathor. Later, return to Luxor and explore Luxor Temple, created over hundreds of years by various pharaohs. This evening, delight in a mesmerizing performance by whirling dervishes and a Nubian dancing performance. Follow the procession route of the pharaohs as we cruise south along the Nile, where magnificent temples and ancient villages line the banks against a dramatic desert backdrop. Disembark at Edfu to explore the well-preserved Temple of Horus, erected to honor the god of the sky. Stand tall beside larger-than-life carvings of pharaohs on the outer walls, and gaze up at the blackened ceiling of the hypostyle hall, believed to be the result of ancient arson. Travel further upriver to Kom Ombo, a temple perched high on the east bank of the Nile and dedicated to Sobek, the crocodile-headed god. Tonight, enjoy a lively evening of music and dance with performers adorned in galabia, traditional Egyptian dress. Continue sailing south to Aswan, a busy market town located just north of the colossal Aswan High Dam, completed in 1970 to tame the regular flooding of the mighty Nile. Meet National Geographic grantees who are excavating an ancient quarry at nearby Gebel el Silsila, where laborers once cut stone for the construction of temples such as Luxor and Karnak. Explore the island temple of Philae, a site of ancient pilgrimage for devotees of the goddess Isis. In the 1960s the entire temple complex was moved to its present location on Agilkia Island because of flooding caused by the construction of the Aswan dams. Visit a nearby quarry to learn about ancient carving techniques and view the “unfinished obelisk.” This enormous monument, half-carved out of granite bedrock, was intended to be larger than any ancient obelisk ever erected, before a large crack caused the project to be abandoned. In the afternoon, explore the Nile by felucca, a traditional wooden boat with one or two distinctive lateen sails. After an educational presentation from our expert, join the captain and crew for a gala dinner. Disembark at Aswan and check in to our hotel—converted from a 19th-century Victorian palace, where notable guests such as Sir Winston Churchill and Agatha Christie once stayed—and admire sweeping views of the river from your balcony. This afternoon, choose to visit a traditional Nubian village, ride in a motorboat to the upper reaches of the Nile, or explore the vibrant Aswan Botanical Garden. Watch the sun set over swaying date palms as you sample delicious Mediterranean cuisine during a private dinner at the hotel’s renowned restaurant. Say farewell as you transfer to Cairo airport for your flight to the UK.